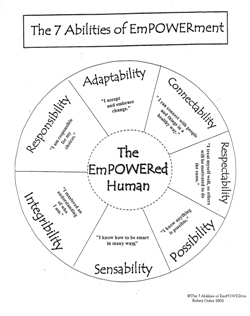 The 7 Abilities of EmPOWERment is a curriculum of concepts designed to teach higher concepts in organizations (families, schools and corporations) and expand the heart of successful systems by focusing on wisdom rather than knowledge. The 7 Abilities are powerful tools to support, strengthen and nourish children/adults to awaken the EmPOWERment we hold inside ourselves to end unhealthy and dysfunctional cycles. They are immediately applicable and connect directly with our heart intelligences. The ability to acknowledge one's own behavior and actions with reliability, consistency, and trustworthiness. The ability to adapt to change and life choices using discernment and an inner guidance system. The ability to understand the relationship of self, with others, and with the universe. The ability to value who you are and "be" with reverence, dignity, and honor. The ability to imagine, wonder endlessly, and create life how it could be, rather than how it should be. The ability to be mindful of and fully embrace the multi-dimensions of oneself and integrate all brain, body, and heart intelligences. The ability to be who you are, to act with authenticity, and to align with personal and professional emPOWERment.